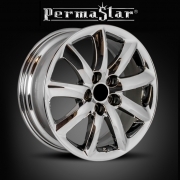 Permastar PVD Chrome Wheels Rims | Wheel Specialists, Inc.
PVD is the abbreviation of Physical Vapor Deposition. 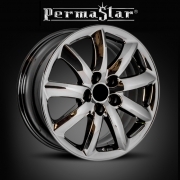 It is a process carried out in high vacuum at temperatures between 150 and 500 degrees C.
PermaStar PVD Chrome is the new modern way of Chroming OEM or Aftermarket wheels. Available in three finishes PVD Chrome, PVD Black Chrome, and PVD Midnight Chrome. 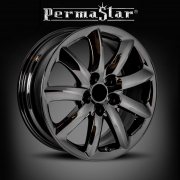 PermaStar PVD Chrome is OEM tested and approved, patented chrome process far outlasts other finishes. Unlike traditional chromed or polished aluminum, PermaStar will not oxidize, fade or discolor, it cleans easily and comes with a five-year warranty!